World Kidney Day is often celebrated in schools. Teachers invite experts on kidney and kidney disease – typically doctors, kidney patients or representatives of kidney organizations – to give a presentation to their students. Educational presentations are also followed by a question&answer session and a debate. The aim of these lectures is to educate students about the importance of kidneys to the overall body health and the consequences of developing kidney disease. The National Kidney Program in collaboration with the Transplant Foundation for Renewed Lives and the Hungarian Society of Nephrology has prepared lectures for school students for many years. In occasion for World Kidney Day 2015 these organizations decided to take a step further. They organized a drawing competition. After the lecture about kidneys, students were asked to make a drawing related to what they had learnt during the presentation. 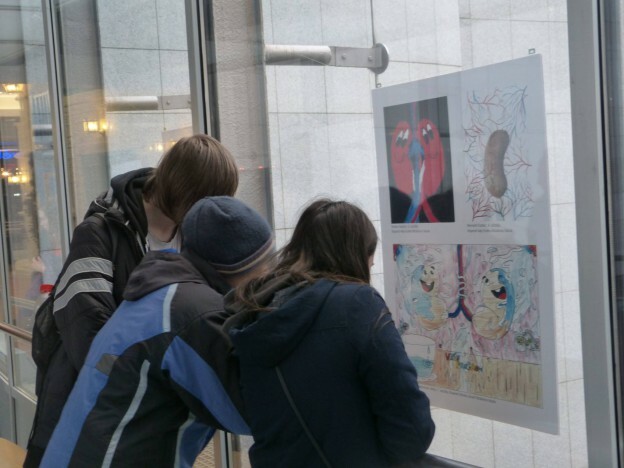 On World Kidney Day 2015, all the drawings received from all the participating schools were displayed in an exhibition and students were awarded prizes for the best ones. Here is the story of this great idea told by Virág Böcskei, representative of the National Kidney Program. In the run up to World Kidney Day, Zsuzsa Szalamanov and Virág Böcskei visit several locations around the country and give informational presentations about kidneys. This initiative of the National Kidney Program is supported by Fresenius Medical Care, BBraun Avitum, Diaverum and the Hungarian Society of Nephrology. “We contact the schools and educational institutions and collaborate with a company organising health-related events. Whenever they organise a health day at a school, the “kidney lesson” is always included in the programme,” they explain. The purpose is to encourage students to understand the importance of prevention and learn about people who struggle with the disease, as well as find out about dialysis, donation and organ transplantation. Giving informational presentations in schools is not new; many non-profit and state organisations do it about several topics. The idea of participating in a drawing competition after the lecture is what makes a difference. “Students take the topic with them after the presentation, to the after-school programmes, drawing clubs or other places: they create their drawings, talk about it, and think about it”. Teachers play a significant role in the drawing contest and encourage children to participate. An enthusiastic jury of doctors, representatives of non-profit organizations and artists evaluate the drawings. Another enthusiastic team helps to set up the exhibition materials. The organization believes in the value of this exhibition and its role telling as many people about the importance of protecting our kidneys, as well as the complex and crucial role they play. Some 60,000 people learned about the importance of kidney disease prevention and proper hydration.